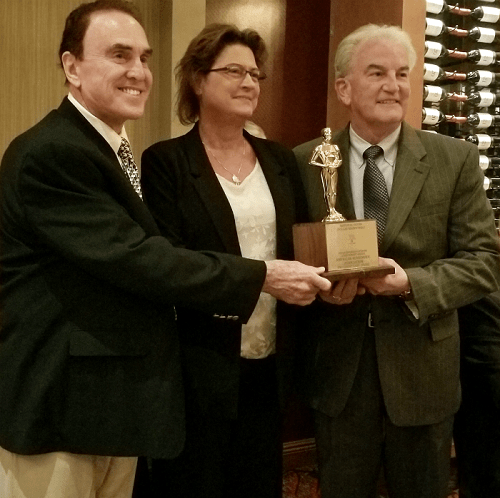 John Highfill (left) presents the NSDR Corporate Lifetime Achievement Award to ANA Executive Director Kim Kiick and ANA President Gary Adkins. During the Florida United Numismatists (FUN) convention in January, ANA President Gary Adkins and ANA Executive Director Kim Kiick received the 2018 Corporate Lifetime Achievement Award on behalf of the ANA from the National Silver Dollar Roundtable (NSDR). The award was presented at the NSDR Banquet at the FUN show on Jan. 11. The award was presented by John W. Highfill, founder of NSDR. The National Silver Dollar Roundtable is a nonprofit educational organization dedicated to advancing knowledge of United States silver dollars along educational, historical and scientific lines. ANA Education Director Rod Gillis is presented with the Ambassador Award by Dave Harper, editor of Numismatic News. 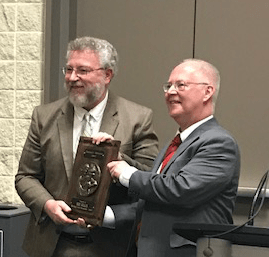 Also at FUN, ANA Education Director Rod Gillis received the Numismatic Ambassador Award in recognition for numismatists who have given countless hours of service to the hobby. The award was started in 1974 by Cliff Mishler of Krause Publications and is presented to five numismatists every year.